Last week a Sikh police officer in India saved a Muslim man from being lynched by a mob, merely for standing near a temple with a Hindu girl. This is a poignant illustration on that, by student Umar Khalid. I didn’t see seculars, certainly none of you, ever shedding a tear for this guy. I doubt any of you even came to know! In contrast, Hindus ALL over India are making big noises (and rightly so) over this particular incident. There is a general “secular” style guide that Hindu deaths are not worth ever making an issue of. Muslim lives are important, Hindus deaths are as consequential as animal deaths. This is why it is a crime, it is inhuman, to be a secular. 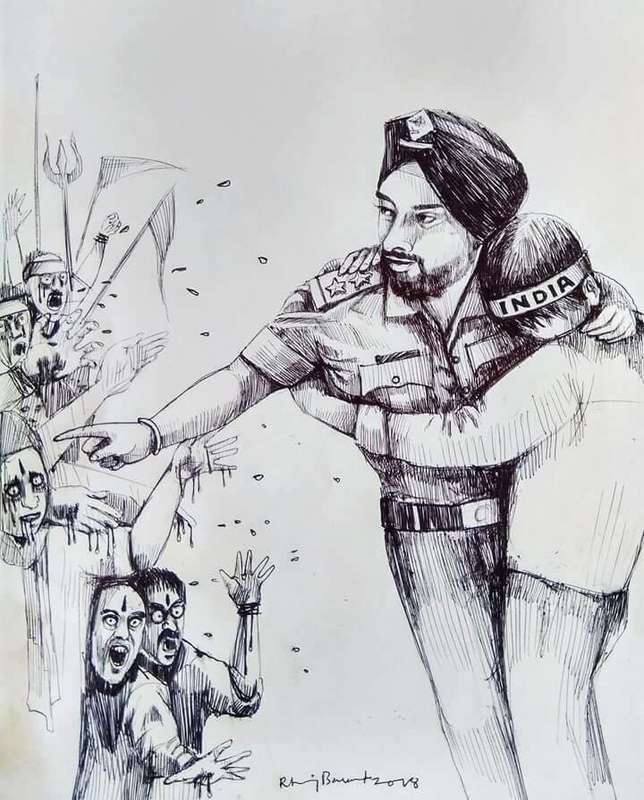 The point of saying Sikh police officer specifically (it could as well have been a Hindu police officer, wouldn’t make a difference), though it had absolutely no role to play, is a political design to subtly sneak into the readers’ mind an impression that Hindus are evil and Sikhs and Muslims are nice people who should unite against Hindus. BTW, can anyone point to me if ANYONE EVER on BP has devoted articles to attacks on Hindus in India by Muslims? Similarly the portrayal of Hindu symbols like Tilak and Trishul in the illustration, which are not there in the original photos or video, is again a disgusting tactic to create a psychological association between Hinduism and violence. your comment was in mod because of the link. i pushed it through. zack can delete it if he wants. Muslims are a minority in India. Crimes against minorities generally receive more attention. Not saying that is how it should be, but that is reality all over the world. Zack did you just delete my comment? I am reposting a toned down version of my original comment. Notice that the headline is just “Youth murdered over love affair”, without mentioning the religions involved. In contrast with headlines on this incident. 2. The fact that the policeman was a Sikh is of no relevance. What is the motivation for pointing that out? 3. The photos and the videos don’t have Tilaks or Trishuls. Why does the illustration add them on? No I did not delete your comment. I also asked Sunny Hundal to post your link to highlight Muslim intolerance (https://www.facebook.com/sunnyhundalorg/posts/1944153472321393?comment_id=1944470905622983&comment_tracking=%7B%22tn%22%3A%22R4%22%7D). I posted your link into a main post though I find it suspect when Caste Hindu push Dalit Rights to be honest. The Dalit question can only truly be talked about by Dalit commentators (of which we have two and knowing Sereno he may have put himself in that category; the Irish Dalit) themselves not caste Hindus, Brahmins and Muslims. Thanks, both Zack and Razib. I apologize for wrongly suspecting deletion – this time it didn’t say that the comment was awaiting moderation, that misled me. The Dalit issue: I am not trying to pretend that I have a moral authority to comment on Dalit issues, though perhaps I can comment on it as a human issue, and remark on a reporting pattern? Anyway, I appreciate your evenhandedness and maturity in responding to me. I had got carried away. Thanks Zack. I am happy to be part of the Dalits. That said cant talk for discrimination that I am sure Dalits have had to endure. I have never felt discriminated based on caste, ethnicity, color, height you name it. Maybe I am thick skinned. Caste discrimination is almost non existent in Sri Lanka Sinhala polity, maybe in my parents generation, thats many decades ago. Granted we have issues of Muslim/Sinhala/Tamil discrimination and friction. My wife who just passed away a few months back was from a very low caste in Sri Lanka. I had never even heard of that caste till she told me and then read about that particular caste. He father was a lower level Sinhala speaking govt employee. Her first husband too was a Sinhala speaking supervisor in the Railways. They also had some Paddy land. Caste and economic status dont go together in SL. Caste was probably the least of my late wife’s problems. Widow at 25 with four children and quite attractive. Even a the husbands govt pension would have been insufficient. I lived a for about a year in her community neighborhood many years ago. Generally lower middle class relatives at that time, most owned their house some houses better than others. Had some of my friends relatives who lived nearby, large land owner class. We got invited for a meal (generally lunch) a couple of times. Nary a mention of caste or differential treatment. It was not like I was doing well and they needed to keep in contact. It was just that they had known me since I was a teenager. b) Free Education (Literacy rate was probably over 80% in 1970,; 92% in 2016). Free Education, huge young population and an economy unable to absorb the educated young. The first Civil war was between Sinhalese vs Sinhalese , 1971 and then in 1987-1989. 2) Indian govt training LTTE (and other groups) as 197 govt was leaning West/US. Probably would have been a small civil war that ended like the JVP. There was very little support from middle/upper middle class Tamils for the LTTE. There is plenty more detail, but thats the big picture. What would you suggest India should have done differently (diplomatically perhaps). Or would you rather India not intervened at all? Was just going through your comments on various foreign invasions on Sri Lanka. I did my schooling in Orissa and there is no mention of any thing remotely Sri Lankan in their school textbooks. The other day i was talking to a friend who is a oriya and he laughed it off as myth. If you could point me to some books specifically which talk about the Kalingan kings. This correlates quite well with my (yet rather limited) experience of expat Sri Lankans – they seem a very un-insecure, non-discriminatory and chill bunch. And they don’t carry that resentment of colonialism that most Indians and Pakistanis I’ve met seem to harbour just under the surface and use as a crutch to rationalise our shortcomings. I’m going to SL for a couple of weeks in July and really looking forward to it, especially to trying out my ‘impure’ Indian tamil in the streets! Bounce me an email. handle at gmail. Let me know if travelling with family, if children ages and length of stay. Will send some suggestion with links etc. If getting a guide book, suggest Rough Guides. Better descriptions. c) Pophams Arboretum in Dambulla. Good chance of seeing Loris and Mouse deer. e) Delft Island in Jaffna, time permitting. Our plan is Colombo – Nuwara Eliya – Kandy – Jaffna – Trincomalee (whale spotting and diving) – Sigiriya – Colombo. Since we’re attending a traditional marriage, there’s going to be quite a bit of Hindu temple visiting, which I’m quite excited about. I’ll try to check out pigeon island while at Trincomalee, looks cool. And I didn’t know there was a Delft island! Guess the Dutch roots go deep. It’s a pleasant coincidence, I actually studied and lived in Delft for a couple of years, it’s got one of the most underrated technical uni’s in the world, and is one of the most charming towns in the low countries. While in Nuwara Eliya, do a visit to either Moon Plains and or Horton Plains/Worlds End. Assume you will traveling in a some vehicle. Suggest you get the vehicle to Drop you at Pattipola (highest rail station in SL) and take the train to Kandy. The vehicle can take your baggage to Kandy. The ferry leaves at 8:00 and the last one back is at 2:00pm. Personally I think the snorkeling in Pigeon Island is better than the diving. Prepare for sticker shock. USD 35 entrance fee. I think there is SAARC rate, will need to show Indian passport. 1. If sbarrkum has never been discriminated on the basis of caste, and if that sort of discrimination is almost non-existent in Sri Lanka as he claims, I don’t quite see how that confers greater moral authority on him to write about Dalit matters than someone like me, just on the basis of genetically having been born (partially may be) in the Dalit caste. If anything, I have Dalit/so called lower caste friends who were genuinely disadvantaged because of their background, whom I have tried to help. 2. To start with an analogy for the second point, I find it reprehensible when some south Indians plug their superiority over north Indians based on HDI-related factors, because south Indians were insulated from many of the fractures that north Indian society (and Pakistani society) were subject to, for purely geographical reasons. So there is some historical-context-ignorance in simply stating how south fares better than the north, ignoring the historical nuances that played a role in forming those. This has parallels to how a white racist in the US would simply quote higher crime stats among the blacks without historical-context-awareness, or how a European racist might talk about migrant crimes, though the degree of course differs. Exactly the same holds for Sri Lankans trying to sneakily plug their superiority of their society over Indian society. Sri Lanka did not have to face the same set of disruptions as the north or the south. It is sad that “liberals” usually reserve all historical nuances for select demographics, and virtue-signalers eagerly lap up biases of this sort as this offers them an efficient machinery to carry out virtue-signalling. I was making a lighthearted point because Sereno is positively anti-caste so I thought he might have marked himself as one of our two Dalit readers (hence the Irish Dalit).. Exactly the same holds for Sri Lankans trying to sneakily plug their superiority of their society over Indian society. No question, but not that all sneaky. I live in SL, not a US resident or GC so try to present why SL is not a bad place to live if wants (not needs) are minimal. Sri Lanka did not have to face the same set of disruptions as the north or the south. Since 900 AD Sri Lanka has been subject to invasions. Initially the Chola/Pandya/Kalinga. Then the Europeans Portuguese, Dutch and English from about mid 1500AD. See at bottom the Uva Wellasa Rebellion in 1817 and consequences. The Sinhalese(*) moved their capital from Anuradapura (500 BC- 500AD) to Polonnaruwa (1100 AD) , both in the North Central Province, Rajarata. After 1100AD they kept moving South and West. Couple of Kings around 1100AD were completely Kalinga (e.g. Nissanka Malla), i.e born in Kalinga. Think Norman Conquest of England in 1066 and William I’s apparent right to England. Magha of Kalinga completely destroyed temples, irrigation systems. Malaria and Climate change are also proposed as compounding the problems in the Rajarata. Most of the population moved to the Hill Country and South. The Tamil Jaffna Kingdom/Chieftainship established around 1200AD, Kalinga or Pandya sub chiefs. There is no record of that polity building/maintaining irrigation systems to support (relatively) large populations in the North. The Sinhalese are busy fighting among themselves. The south is divided into little petty chieftainships. The Portuguese come to Ceylon. Given trading rights in Sinhalese maritime areas. They capture Jaffna. Install a puppet who also rebels. Jaffna and the North are the first to be completely under European rule. Portuguese, destroy temples (Buddist and Hindu) and books. Mass scale conversions. Most Christians (9%) in SL are Catholic. Dutch make inroads into the Maritime Provinces. The Sinhalese/Kandyan Kingdom, has retreated into the Hill Country. The English take over, essentially a division between East India Company and Dutch East India Company. The last three Kandyan Kings are Telugu, Waduga Nayaks (Nayakkar). The feudal nobles in Kandy preferred outsider Kings whom they could control and not a local as one faction could become powerful. Did not work to plan. Nayaks were brought in and some of the Kandyan feudal s conspired with Dutch and English to get rid of the Waduga. 1815 the English invade and take over the Kandyan Kingdom. 1817 the Hill Country rebels against the English. The British massacred the male population of Uva above the age of 18 years. Dear froginthewell, There is something in the Sri Lankan mentality while in Sri Lanka (whatever ethnicity) that makes us move on. I have a cousin killed by the LTTE. Other cousins (Tamils) who were tortured by the SL Army and got refugee status in the West. They visit SL regularly and have bought property with the intent of retiring in SL. From my Sinhalese side two cousins, children and grand children who were lost to the Tsunami. My nephew Carmen Liyanage killed by the Army in deep south. One of my ex “Significant Others”, parents killed by the LTTE in the 1990. *Sinhalese. My opinion. Sri Lanka/Sinhalese has been a country of assimilation. An old US. Its a small country and population and still easy to intermarry and blend into the locals. Perhaps. Within our lifetime , the ethnic conflict started due to religious-ethocentrism from the Sinhalese side. For a small country with a small population, Srilankans have tore each other apart with gusto. Sinhalese society may be less caste-conscious than India or Tamilnadu , OTOH ethnic conflict -stoked by majority community with the minority driven to a corner , which was solved by brute force – for this generation anyway – does not speak well of overall attitude to compromise or tolerance. I won’t extend my earlier comment about expat Sri Lankans being chill to Sri Lankans in their homeland – not until I actually visit and make up my mind. Yes, majoritarianism plagues us all. And the Ethnic Cleansing that happened in Sri Lanka’s recent history is shameful (both sides– the government and the LTTE). The UN had a war crimes panel on it I believe. The Sinhalese are majority with a minority complex. A majority in Sri Lanka and minority with 65million Tamils 30km away, and 1 billion Hindus. Quite tolerant, except for separatism or any political solution (say Federalism) that would appear to be a stepping stone to separatism. The fear of separatism is that India will use it as stepping stone to annex Sri Lanka. This is quite a justified fear from historical experience and India’s training the LTTE. The other is what is called the Mahavamsa mentality. The Mahavamsa states that the Buddha chose Lanka as the keeper of Buddhism. They see Buddhism has been eradicated in India, the birthplace of the Buddha. No question a brutal war fought against a brutal Terrorist organization. The LTTE were never going to settle for anything less than a separate state. If a separate state ever happened, Partition would be a walk in the Park. And it would have all been one sided, with 65% Lankan Tamils living among the Sinhalese and less than 1% Sinhalese in Tamil areas. The Indian/Upcountry Tamils who have been just bystanders in the separatist fight would also be expelled (at the very least). Then India would have to get involved and would have been one big mess. However brutal, better the war ended. It’s definitely better the war ended but let’s not make excuses for ethnic cleansing. They have a much more “tropical” and fluid culture than the staid Indo-Gangetic (blame the Brahmins, Muslims and Brits for that). I notice Tamil Nadu is more straitjacketed than SL.